It is a type of solid state welding process, in which explosive material are used to pressurise the specimen to brought together and develop a joint between them by plastic deformation. The small strength explosive are used which can generate appropriate pressure pulses to produce plastic deformation in the metals. By this method dissimilar metal are easy be joined. When the explosion takes place in the explosives a pressure is developed which force one specimen towards another to generate the joint. Explosion will generate the higher pressure force which cause a very quick action in the specimen attached with the explosive material and further process of joining also occurs very fast. The explosive welding is not very old or ancient metal joining process. The beginning of explosive welding happens about 1945. At that time it was not considered an efficient method of metal joining. Then changes and developments has been done and the improvements has been implemented. At present time explosive welding is an efficient method and useful solid state welding process. 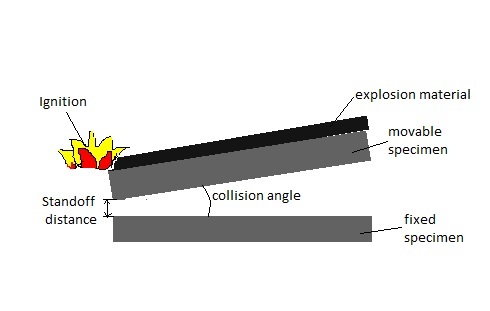 In the preparation or setup of explosive welding the two specimen will be kept at an angle as shown in the figure. This angle is called collision angle. The specimen would be kept at some distance. This separation is called standoff distance. One specimen should may be kept at horizontal which must be rigidly fixed and other would be angled. The explosive material is placed onto the specimen which is movable and kept at an angle to the fixed workpiece. In the preparation of explosive welding all the steps mentioned above should be followed. The standoff distance and collision angle should be provided in the system. The explosive material is then ignited. The burning of explosive material will proceed gradually form one end of the specimen to another end. With the propagation of blast or explosion the pressure will force the material to come close to each other and produce a joint. Joining will take place simultaneous to the explosion in the material. This is a simple process and easy to operate. Properties of material do not changes after the process. Explosives with low intensity is used. Various material and large range of thicknesses can be joined. Materials with different properties can be welded which cannot be welded with conventional welding method because there is no melting of material happens in the process. Sheets with large surface area can be joined. It is a fast and time saving process and the process can be implemented in mass production. It is an economical method of welding. Safety equipment of good quality is required due to noise and explosion. Specimen with complex geometries are difficult to weld. The fixed specimen should have high rigidity otherwise welding defect may occur. Appropriate intensity of explosion is required for which the skill and knowledge is required to recognise the suitable explosive material. Metal should have high strength, high toughness so that it can wear the impact and pressure induced by the explosion. Operator should be experienced and skilled.